Texas slot canyons are rare and beautiful. While most folks may be familiar with those in Arizona and Utah, they are not aware of these creations in their own Texas backyard. 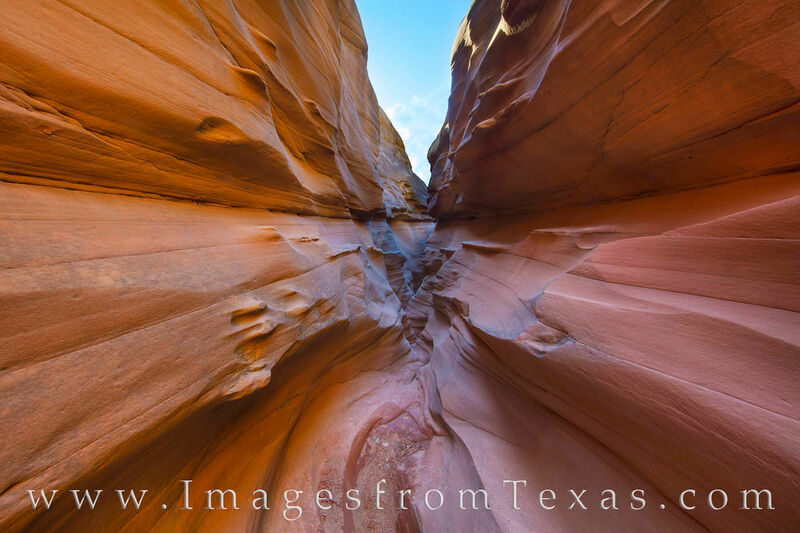 This image shows Central Utah's Upper Slot Canyon, one of the hidden secrets of Palo Duro Canyon State Park. Formed by infrequent rainfall but rainfall that occurs and causes flooding in the same locations over a long period of time. The sandstone, usually found between 3100 and 3200 feet in elevation, gradually erodes and forms delicate stratiations and curves. This slot is one of the Llano Slots and resides in the Llano Estacado. The hike to reach this location covered 9 miles by the time we'd gone out and back, and we were able to explore three different slot canyons. Each slot had its own unique look, and when the morning light of this November day was overhead, the indirect light turned the sandstone walls of the canyon hues of orange and purple. Photo © copyright by Rob Greebon.